I love robots. I think they’re really cool. I’m especially excited about the future of robots. One of the simple ways that robots are changing our lives is by vacuuming our floors. 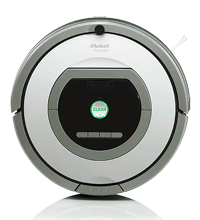 I thought it would be really cool to start a site with news and reviews about robot vacuum cleaners in general, and about the iRobot Roomba specifically. I’m also thinking it would be interesting to look at other consumer robots and see what’s going on. Hi, thanks for this website. Thanks for not just spitting out worthless specs from the manufacturers and do actual testing of the devices in practical areas like *noise*. Maybe you should expand into a wider technological “market”; so many websites out there are pointless. Think about it; the Engadget/Techcrunch of house tech. Even for something like a fridge, it is important to know how noisy it is. Thanks for the kind words! I am thinking about expanding, that’s a good idea.